Mornings with Mommy isn’t preschool. It isn’t childcare. It’s something different. Mornings with Mommy is a fun and easy way for you to enjoy activities with your children and meet other moms. Each session is a one-of-a-kind blend of story time, playdate, and learning center that combine to meet the developmental needs of young children- from infants through preschoolers. We begin with stories and songs at Circle Time. 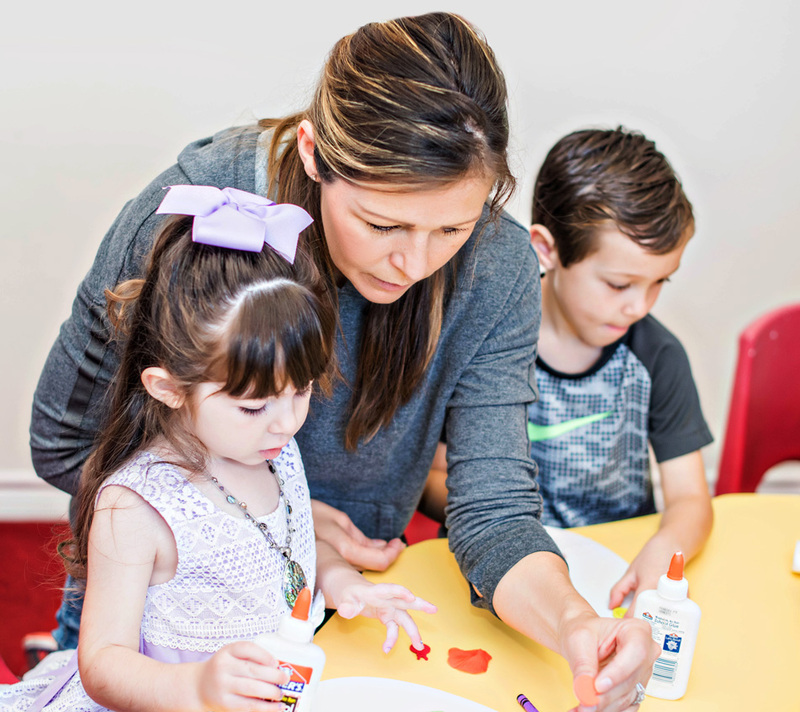 Afterward children and their caregivers are invited to explore a variety of learning centers designed to exercise children’s brains and bodies in creative and fun ways. The program costs only $5 per family, per session and includes all snacks and activities. COST: $5 per family per session. Cash, credit card or check (made payable to Prince of Peace Lutheran Church) accepted. REGISTRATION: Advanced registration is required. Mornings with Mommy is for children ages birth through preschool accompanied by an adult. Dads, grandmas, grandpas, nannies and other caregivers are welcome, too! What happens at Mornings with Mommy? Sessions begin at Circle Time where we open with language and literacy activities on the big rug (stories, flannel board and songs). Sessions end with a snack that you can take to-go or stay and enjoy with all your new friends! Each session is centered on a learning theme (“Music and Instruments,” “Colors and Shapes,” etc.) so activities change from week to week, but the basic structure remains the same. Each session costs $5.00 for each family (not per child). The registration fees are used to cover crafts, supplies and snacks. Cash, credit card or check (made payable to Prince of Peace Lutheran Church) accepted. Yes, registration is required for each individual session. You can register here. Yes! When the session is full a waiting list is formed. Any openings will be filled from the waiting list. What happens if I am on the waiting list? Prior to each session each registrant will be contacted to confirm. If there are any cancellations we will then move on to the waiting list. We will email, text or call you using the information you provided when you registered for the waiting list. If your plans change please email the directors or call to cancel. Any openings will be filled from the waiting list. When does registration open each month? Registration opens on the 24th of each month for the upcoming month of sessions. For example, registration for October sessions would open on September 24th.